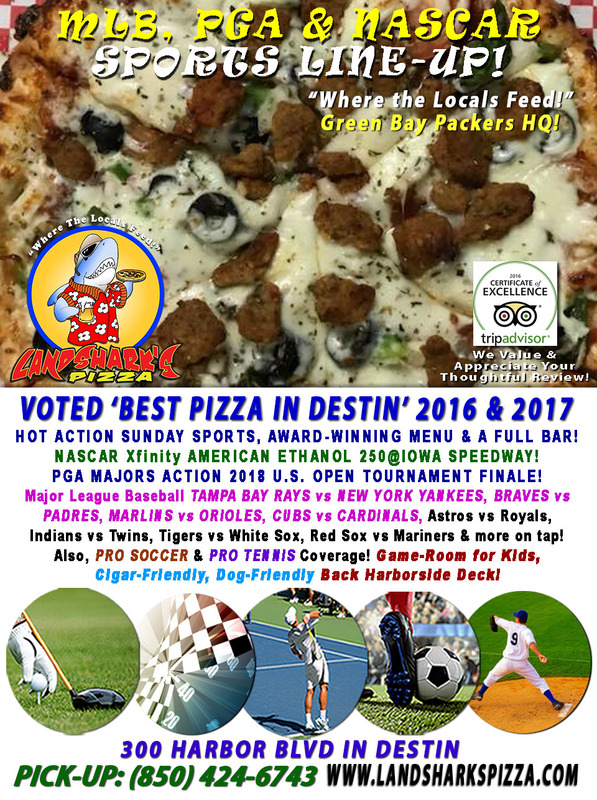 / Best Burger Deal in Destin FL / Burger Monday Beef & Brewskie $9.99 & RAYS vs ASTROS, MARLINS vs GIANTS! BEER TASTING & TEXAS HOLD’EM POKER@6PM! 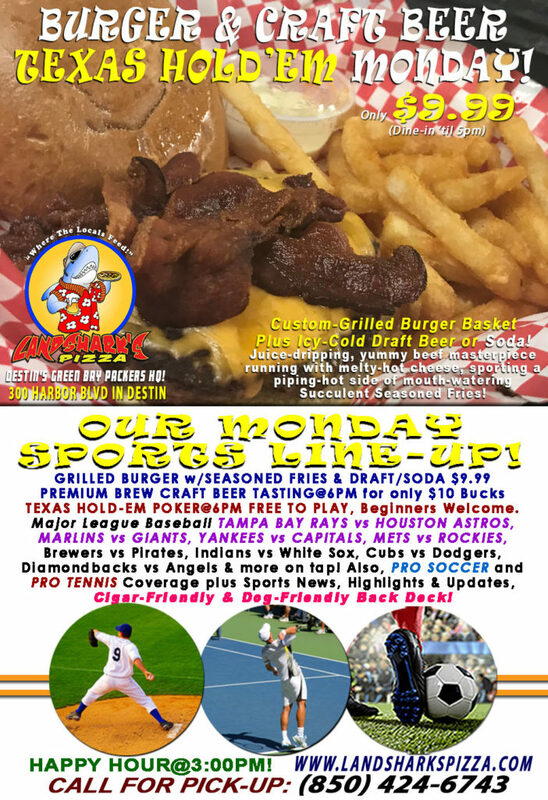 Burger Monday Beef & Brewskie $9.99 & RAYS vs ASTROS, MARLINS vs GIANTS! BEER TASTING & TEXAS HOLD’EM POKER@6PM! Monday Blues are a thing of the past because at Landshark’s Mondays come with an ice-cold beverage and a piping hot, melty custom burger Special, great sports, Texas Hold’Em Poker and good company! It’s Burger & Brew Monday at Landshark’s where you get a delicious Landshark’s beef-zilla burger accompanied by succulent seasoned fries & your choice of icy-cold Draft Beer or a flavorful Soft Drink for only $9.99 (’til 5PM)! TEXAS HOLDEM POKER IN DESTIN – BEGINNERS WELCOME, FREE TO PLAY! 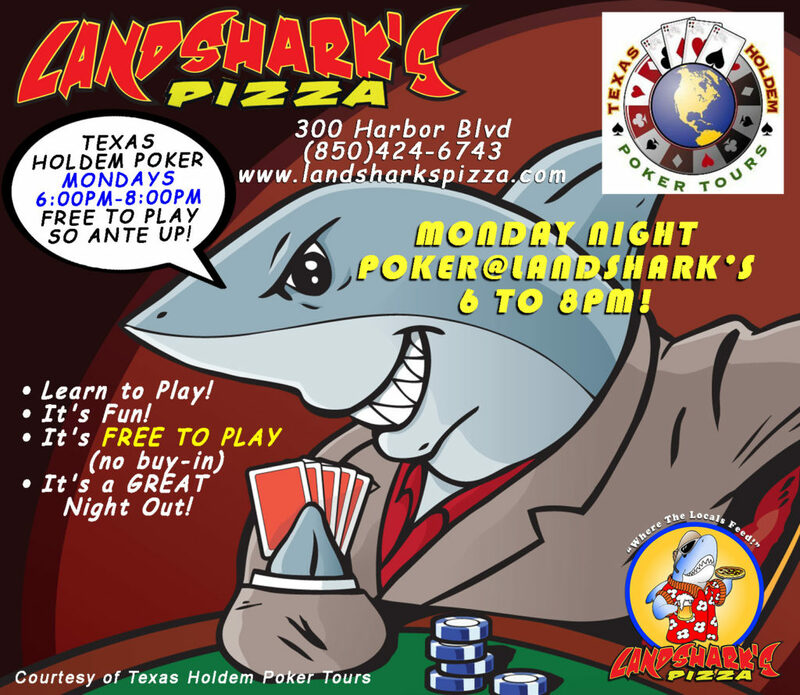 JOIN US AT LANDSHARK’S FOR TEXAS HOLDEM POKER MONDAY NIGHT 6:00PM to 8:00PM! Learn to Play! It’s Fun! It’s FREE TO PLAY (no buy-in) & It’s a GREAT Night Out! 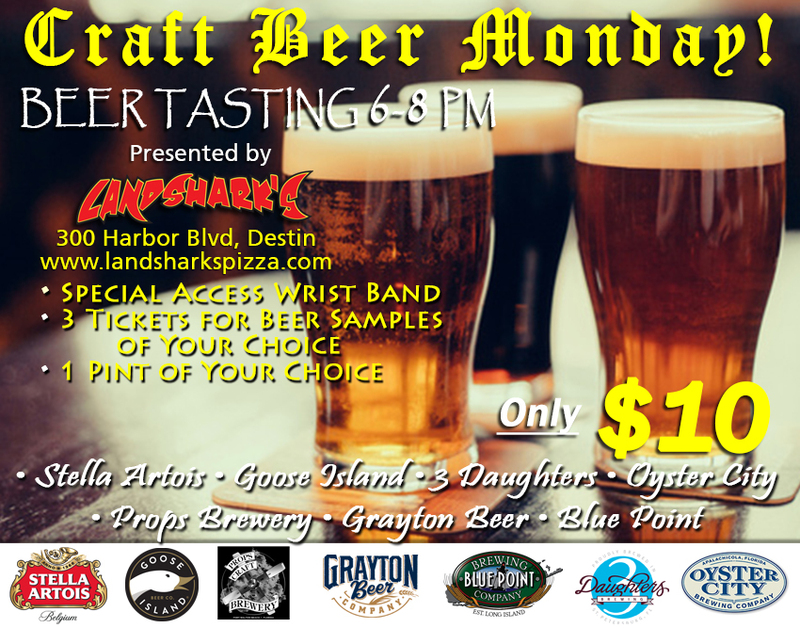 Don’t miss out on our PREMIUM CRAFT BEER TASTING at 6PM – Join in for ONLY $10 – Includes All-Access Wristband, 3 Tickets for sampling the Craft Beer Monday selections of your choice, 1 Full Pint of the Craft Beer of your choice! 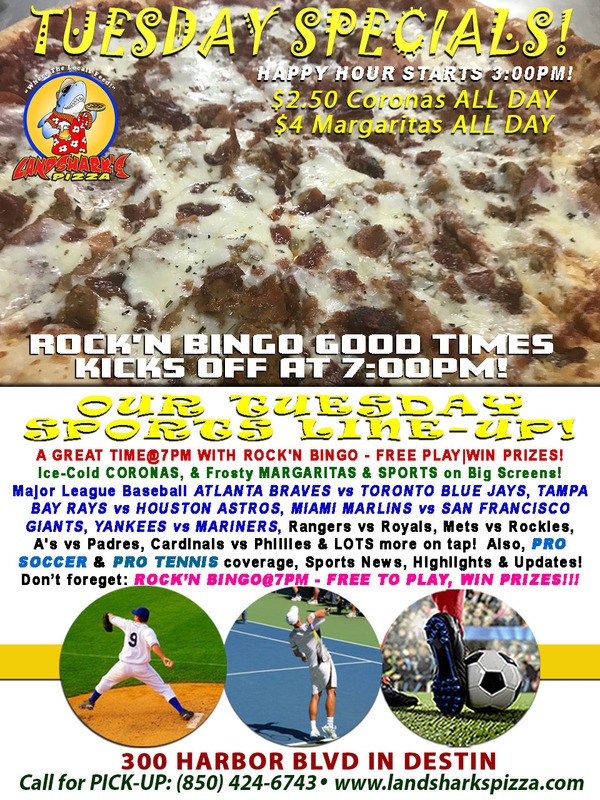 HOT SPORTS ON OUR ARMY OF BIG SCREENS – Major League Baseball TAMPA BAY RAYS vs HOUSTON ASTROS, MARLINS vs GIANTS, YANKEES vs CAPITALS, METS vs ROCKIES, Brewers vs Pirates, Indians vs White Sox, Cubs vs Dodgers, Diamondbacks vs Angels & more on tap! Also, PRO SOCCER & PRO TENNIS coverage, Sports News, Highlights & Analysis! Previous Post: « Landshark’s U.S. OPEN FINALE, RAYS vs YANKEES, NASCAR AMERICAN ETHANOL 250 & LOTS More!